You also need to know just how much you are going to spend on everything and where all of your money is going. 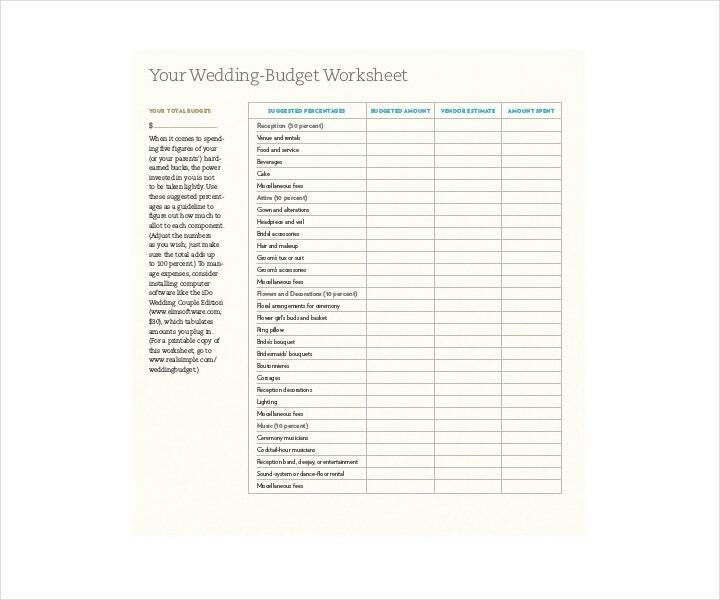 This is why wedding budget worksheets exist to help you out, and this article is going to focus on how you can make one for yourself. 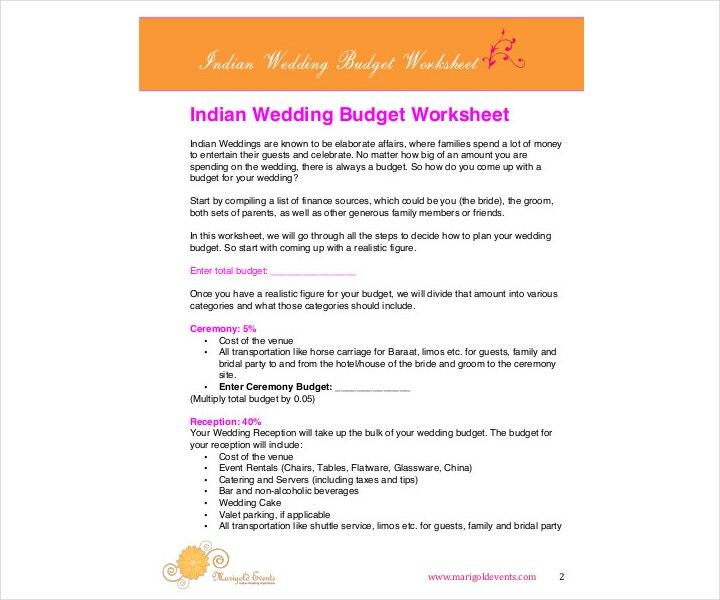 You may also see Budget Worksheet Templates. 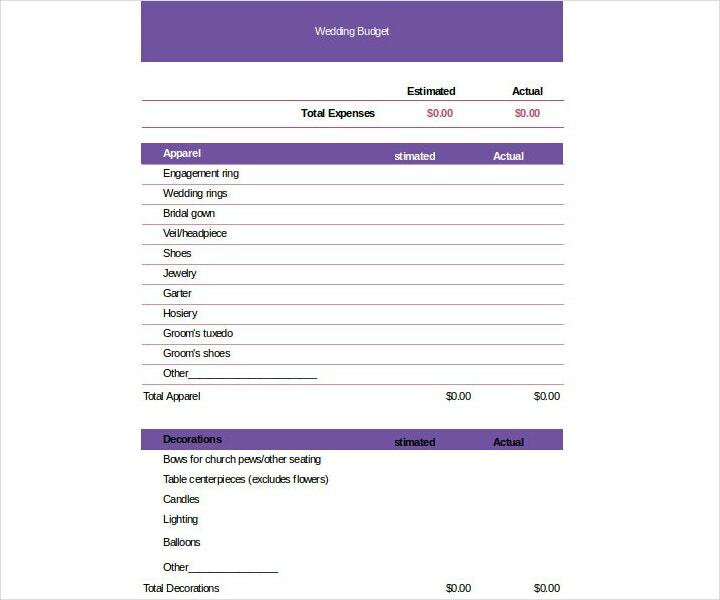 It is a very common problem for couples to run into budget template issues during the second half of the wedding planner template process. 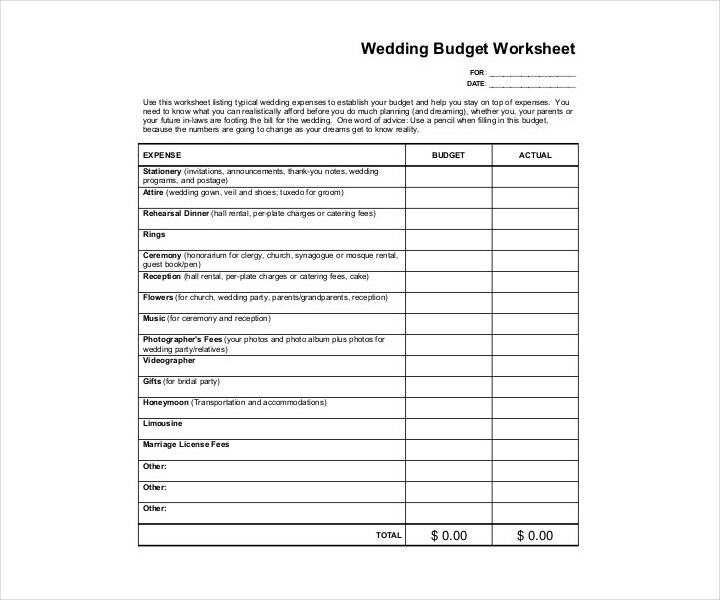 Even if they have already come up with an ideal budget for their wedding, they will find that they just made a guess on how much everything is going to cost instead of actually doing their homework.You may also see Printable Budget Worksheets. It is very important that you write down notes for each expense regarding the method of payment Schedule Template for each vendor you are going to do business with. This is so you can prepare ahead of time if the vendor wants to be paid in cash, will only accept checks, or if you have to pay via credit cards.You may also see Excel Budget Template. Whenever you hire a vendor, immediately place his or her name in your spreadsheet and complete all of the information. If you are the type who struggles to pay the bills by the deadline on a regular basis, then what you should do is place calendar reminders so that you will be notified whenever the balance is due for anything that you have to pay for. There are many cases where vendors will not remind you as they expect you to remember the payment Schedule date yourself. You would not want to breach the agreement contract for failing to pay the balance when the contract says that it is already due. This detailed information will also help you plan ahead so that you will be able to know exactly how much you owe whom and by when, and how you are going to pay them. The point of having this spreadsheet template program is to ensure that you are as organized as you can possibly be. If you are organized, then you are less stressed. Place everything under different categories so that you can easily track where your money is heading. You would not want to confuse the cost of the photographer you hired and accidentally mistake it as the cake expense now, would you? 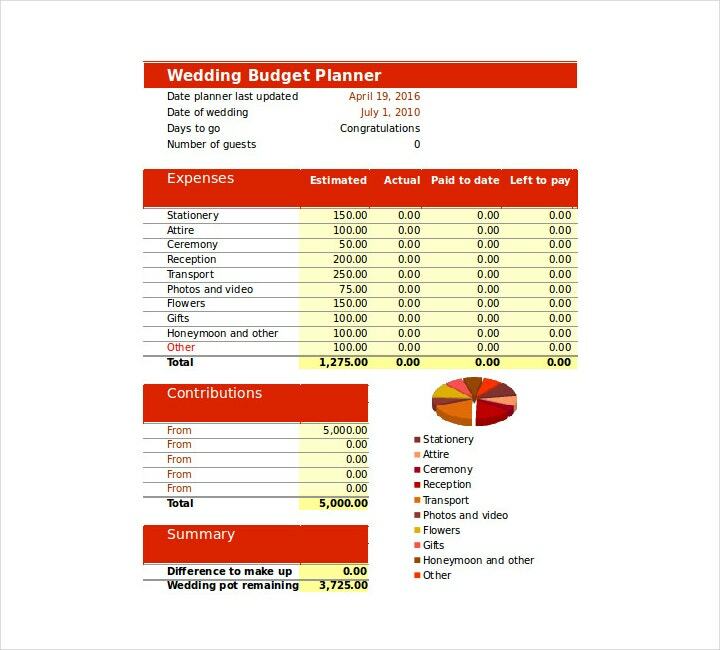 You can start your spreadsheet with some of the following obvious categories: ceremony music logos, caterers, wedding day appointments, flowers, rentals, lunches, and tux and dress rentals. 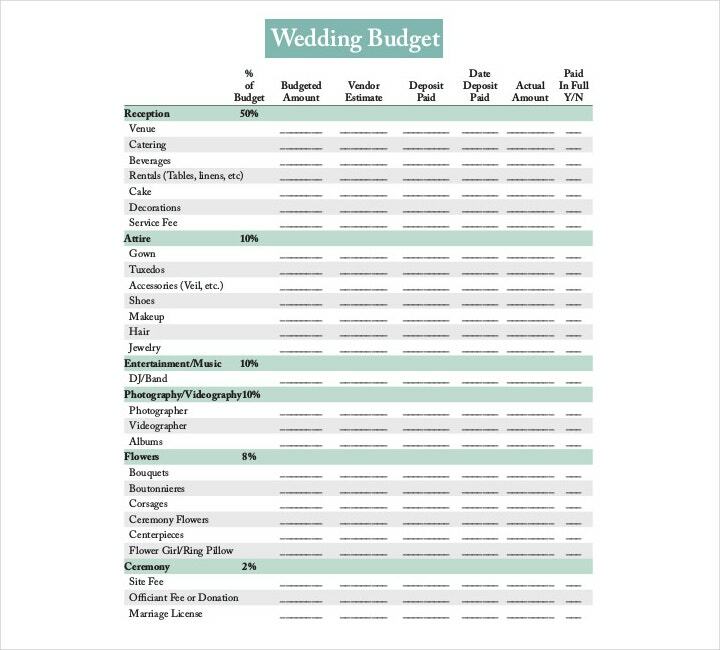 Other categories will depend on what you wish to spend on your wedding. So, you have to make sure that you have a thorough discussion with your spouse-to-be on how everything is going to guarantee that the two of you can place all of the necessary expenses in the spreadsheet template. You should not forget to add an additional line for gratuities ahead of the wedding week. Doing this will help give you a clear idea of who you are going to tip once everything is said and done. There are some venues wherein there are service charges as well as gratuities in their contract template, but then there are those that do not. You need to budget at least 15 to 20 percent of gratuities for every vendor and you have to make sure that you have cash on hand so that you are ready to tip the right people at any given time during the wedding. These people are trying to give you the best service, so they will appreciate it if you give them the tips that they deserve. This should be a no-brainer, but it is very important that you update your spreadsheet when there are any additional expenses, or if there is a significant change in your headcount. You will never know just when you have to pay for an unexpected expense, and basically, all catering service contracts are based on the number of people who will be attending your wedding. If they have to be the ones to adjust because you have a number of additional guests, then that means you have to pay extra. So, once that happens, immediately update your spreadsheet. 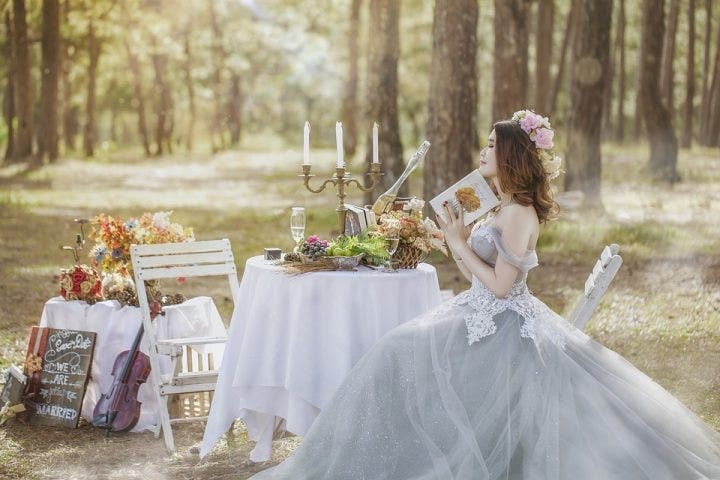 While it is true that hiring a wedding planner can take a lot of stress away from the bride and groom’s shoulders, there is no doubt that it is also going to be expensive when the time comes for you to pay for the service receipt. 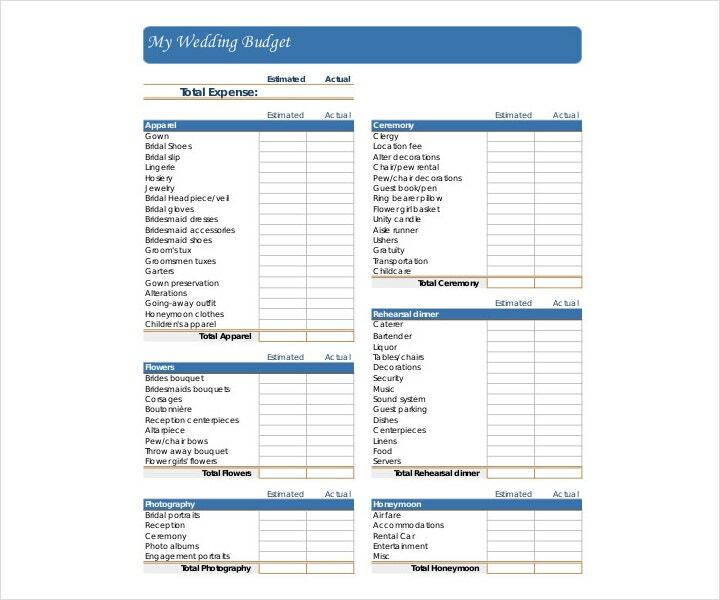 It is very tempting to just hand the wedding planner a blank check and let him or her take care of everything, but you will be saving a lot more money if you decide to handle everything on your own. If you are going to do this, then you should do this as early as possible so that you can find all the best deals when it comes to food, flowers, tux and dress rentals, hair stylists, and more. You can save a lot more money if you decide to find them yourself, plus you will have a direct hand in handling everything so there should not be any surprises when it comes to expenses. Different couples have different priorities, which is why you and your spouse-to-be need to have an extensive conversation about this early in the process. The two of you have to be able to decide what is most important so you can prioritize it in your expenses. Maybe the two of you want to hire a professional wedding photographer to take amazing pictures of your big day, or maybe the two of you just want a really good honeymoon. 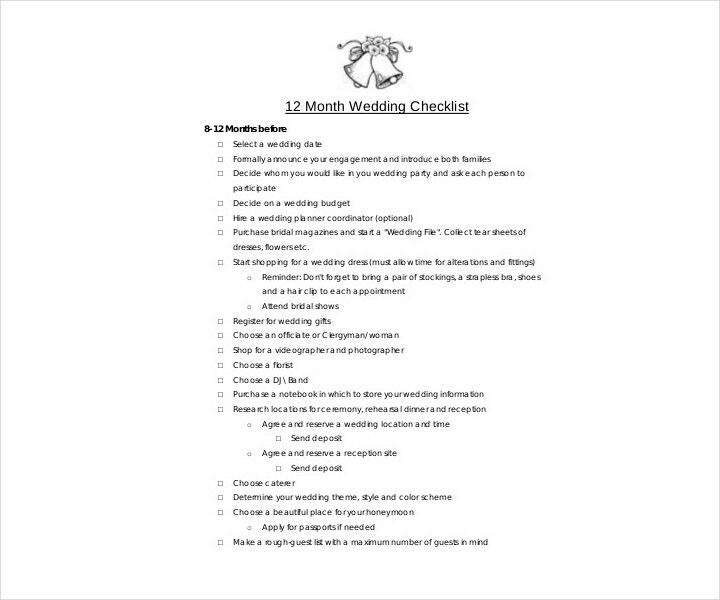 List down everything you want to have for your wedding and rank them in order of importance. This is going to help you out in the event that you have to cut corners later to help you stay within your financial budget. While you and your spouse-to-be may want to invite all of the people that you hold dear such as family and friends, the two of you have to remember that every additional guest is going to raise the cost of the wedding. The more guests your wedding is going to have, the larger the venue you have to rent in order to accommodate all of them, and you will also need a lot of food in order to feed them all. So, think carefully about each person you invite. Do you really need this particular person to be present at your wedding? Alternatively, you could choose to have a more public ceremony, but a smaller, invitation-only reception. Having an intimate wedding where you just invite your closest friends and family members is just as beautiful as a huge ceremony with the people that you care about. Basically, do not go overboard with the people that you want to invite as you may not have space, food, or money to accommodate every one of them. You should never settle on the first of any item that you find. So, even if you see this amazing wedding dress that you know you can afford with your current budget template, do not buy it right away. You need to consider all of your options and find the best deals. Who knows? You may just find an even better dress that you love more and for only half the price! You have to remember to shop smart and go visit as many stores as possible until you see the ones that can offer you top quality at a fair price. If you know anyone in the business receipt, then you could even possibly ask for discounts to help ease the expenses a bit. If you have any friends who are working in the wedding industry, then you should definitely ask them if they can help you out. For example, if you have a friend who is a seamstress, that person may be willing to sew the dresses of your bridesmaids for a lower fee. If you have a friend who specializes in making wedding cakes, then maybe that person can bake you a wedding cake as a wedding present or give you a discount for one. You can even ask your friends to help out with the task of decorating the wedding or reception invitation venue. You may also see Monthly Budget Worksheets. While you can always go to the fancy ballroom or church, a lot of people tend to opt for simple yet beautiful outdoor weddings. You can always do your research and find someone who is willing to rent out a wide area or venue for your wedding at a reasonable price. If your spouse-to-be has his or her heart set on a church wedding, then you can always consider a smaller, local church as the venue instead of a famous landmark church invitation. You may also see budget template. A lot of people would want to hire someone to design and print out their wedding cards. You would honestly be surprised to hear that doing it yourself can actually be quite easy and save you more money in the end. If you or someone you know has Photoshop skills, then all you have to pay for is the price of printing and mailing your invitations out. Although it can be very tempting to hire those catering services that provide you with a fancy three-course menu wedding, you will not be so happy when you see just how much they will be charging you. There are many buffet restaurants with large function rooms you can rent, and many also offer discounted rates for large groups. You just have to make sure that the food selections cater to all of your guests and that there are vegetarian meals for those who would prefer not to eat meat. 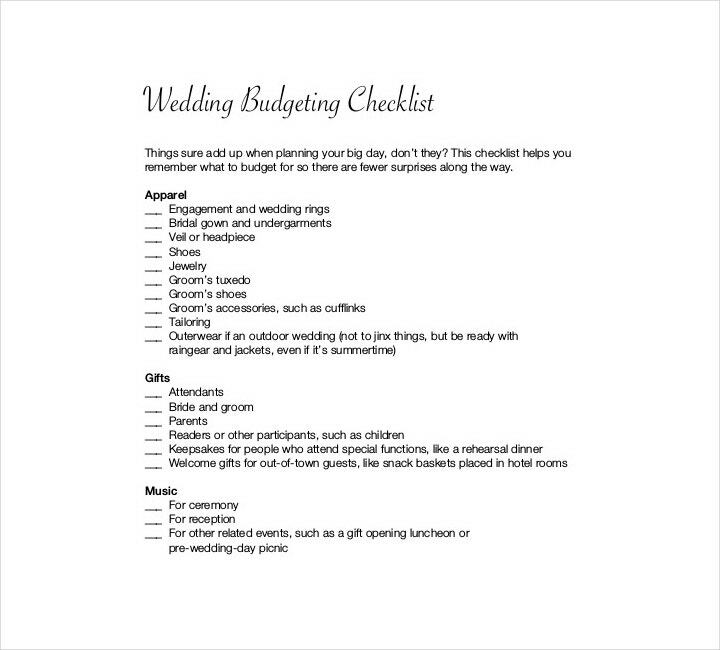 If you would like to learn more about budgeting your wedding agenda or any topic that is related to this matter, then all you have to do is go through our other available articles and they should be able to give you the information that you need to help make your wedding a success.